Delighted to announce my next workshop, which will be held at the Radnorshire Arts and Crafts Foundation. This summer I have been working on an online course that will get you writing, no matter what problems you may have encountered along the way, and this workshop is a condensed, adapted version. So far it has proven extremely useful to those that have done it! It consists of exercises and approaches to creativity that you will be able to apply to your own writing for years to come. What do you do when you can't think of anything to write? What if you have an idea, but you don't know what to do with it? What if you have so many ideas all clamoring to be written, and you end up getting nothing finished? 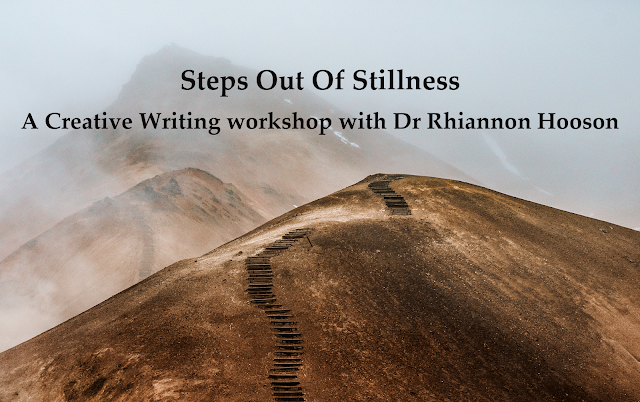 Steps out of Stillness is not a five step plan to a poem or story, but rather a series of exercises that will help you find your own path, and then set you loose to blaze your own trail. It teaches not how to write, but how to be a writer. This workshop is designed for those who need help either breaking out of writer’s block, returning to writing after a period of inactivity, or those just starting to think about writing who would benefit from structured exercises and a thoughtful approach to exploring their own practice. It is also suitable for experienced writers wishing to expand and sustain their creative practice. The workshop will focus on equipping you with new strategies and techniques for generating work, leaving you more self-sufficient in your inspiration. Please bring with you any notebooks that you have been keeping, as we will be using them during the afternoon. The Old School, Whitton. 1.30 – 4.30, £28 including afternoon tea. Please note this workshop is now sold out. I will be adding another date in the new year, if you would like to be put on the list for that, or on the waiting list for the November date in case of cancellation, please let me know.